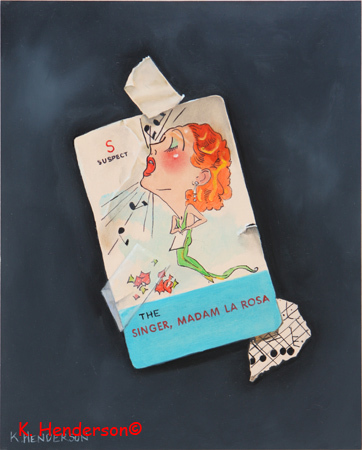 This trompe l’oeil painting was inspired by a card from a vintage Old Maid game. I thought a coffee stain would enhanced the Waitress theme. 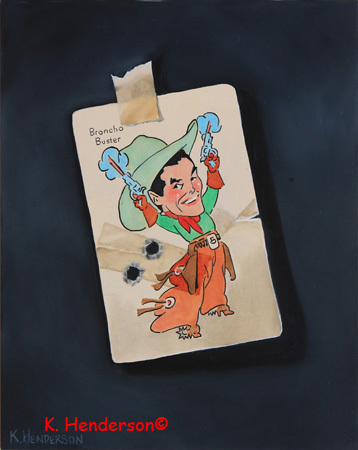 This Trompe L’oeil was inspired by a card in the 1938 game, Who is the Thief . I wonder who she is calling. 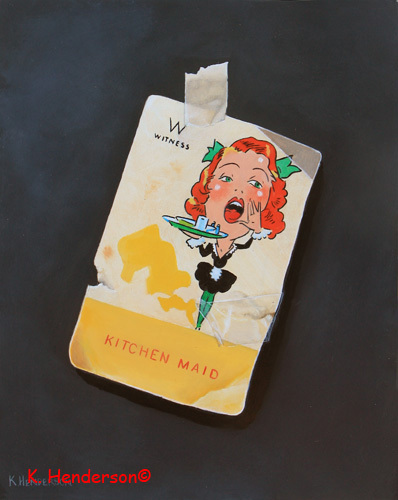 This trompe l’oeil painting continues my Food Service themed Vintage Cards. This was inspired by a card from a vintage Old Maid game. 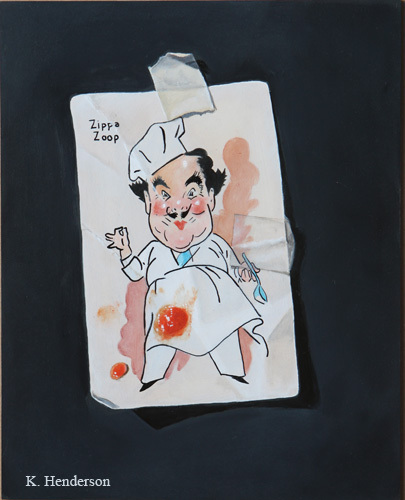 And why is it that cooks always have such spotless aprons? Not in my world! 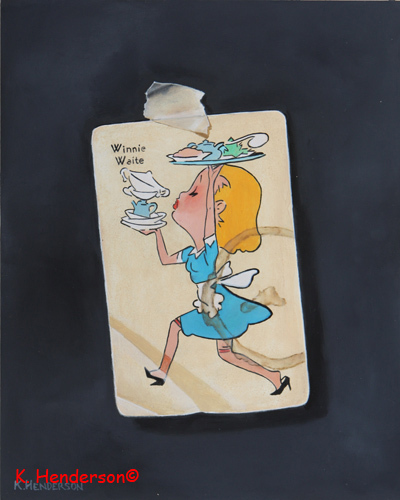 This trompe l’oeil painting was inspired by a card from a vintage Old Maid game. A few bullet holes were added to create authenticity. Music. 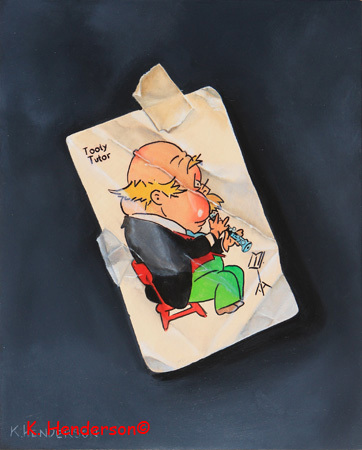 That is my current theme for my Vintage Card trompe l’oeil oil paintings. 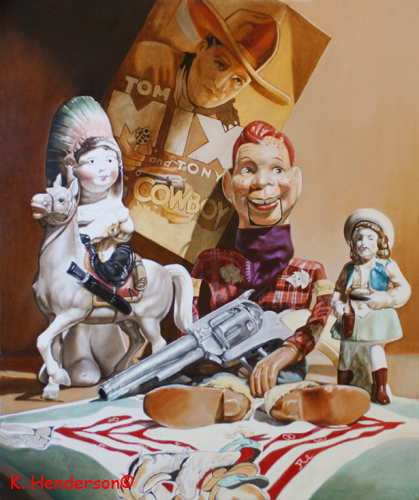 I had great fun putting this trompe l’oeil painting together. I chose each object to symbolize Superman or his powers. The blue, red and yellow shield, of course, is Superman’s trademark. Superman has Xray Vision. This came from a comic book ad selling those cool glasses. “splo…” is one of those comic book words we’ve all come to identify with Super Heros. The round magnifier is used to symbolize Superman’s Super Vision. He can see tiny things no one else can see as well as the ability to see far distances. Superman is able to leap tall buildings in a single bound. “Kryptonite Is Superman’s Worst Enemy”. Well, that’s the way they put it in the old radio shows. That makes it sound like kryptonite is going to sprout legs and go chasing after Superman. He’s more powerful than a locomotive. The stamp is just cool. 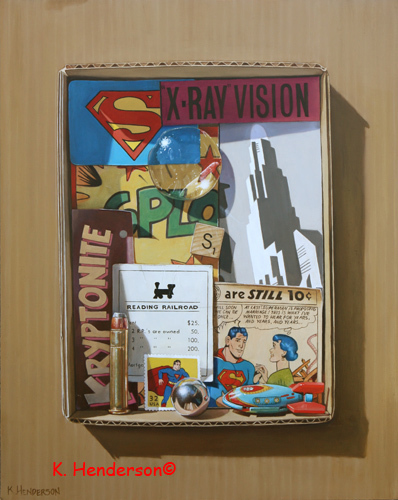 The steel ball is there because Superman is known as ‘The Man of Steel’ and because I really like painting it. Where would Superman be without Lois Lane? Probably in a lot less trouble! And the rocket, of course, because Superman arrived on earth in a spacecraft from his home planet of Krypton. 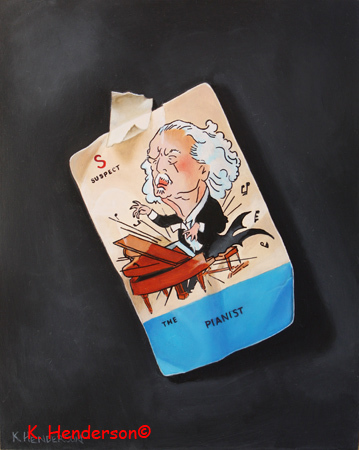 This is the second of three in my Music themed Vintage Card trompe l’oeil paintings. My Contemporary Realism still life paintings tend to be complicated with lots of ‘stuff’ in them. With these vintage card paintings, my goal is to keep them simple and add nothing outside the card. I broke my rule by adding a scrap of sheet music. 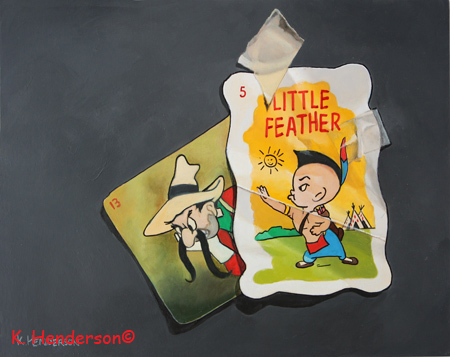 I haven’t created one of my Vintage Playing Card paintings in a while and when I found this “Little Feather” character I knew he would be perfect for a Cowboy and Indian painting. Dastardly Bad Bill Bunion is a good counterpart for the young brave. This card is from a game called Who’s the Thief?